Hello Frndzzz.... www.dealsnloot.com Again Back With New Bookmyshow Deal. BookMyShow offering flat Rs. 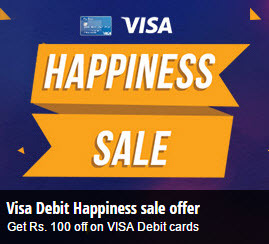 100 off on Movie Tickets for first time Visa Debit Card users. Offer available only for first time ever VISA Debit Cardholders. One cardholder can avail the offer only once during the offer period. Offer expires on 30th September 2015. Offer is applicable only for movie tickets purchased on BookMyShow. The Offer is valid only for select bin ranges. Offer will be available only on the BookMyShow Website. The quota for this offer is limited and can be availed on first come first serve basis.